“European Style” tells us that Straus (please pronounce with a German accent) rejects “American Style,” which means sour and flavorless. 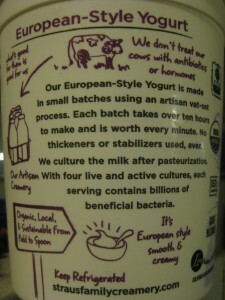 The container sports hand-drawn looking pictures of cows and grass and spoons along with faux handwritten text. The back of the container boasts “organic, local, & sustainable from field to spoon” which suggests pampered vegan cows, Marxist farmers and no evil corporate middlemen. 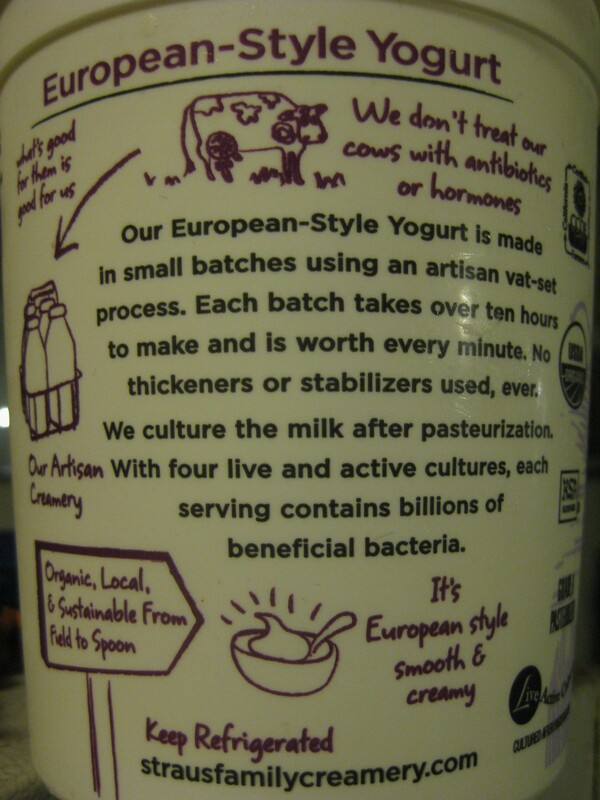 The yogurt is made in what Smug Scout believes to be a dazzlingly artisanal way: “incubated” in stainless steel vats, of course in small batches that take “over ten hours to make.” Wow. It is not made; it is born. So clearly this yogurt passes Smug muster, and Smug Scout could end her post here were it not for the fact that this yogurt is driving her insane. As you should already know, Smug Scout eats yogurt every day with granola and local, organic fruit. 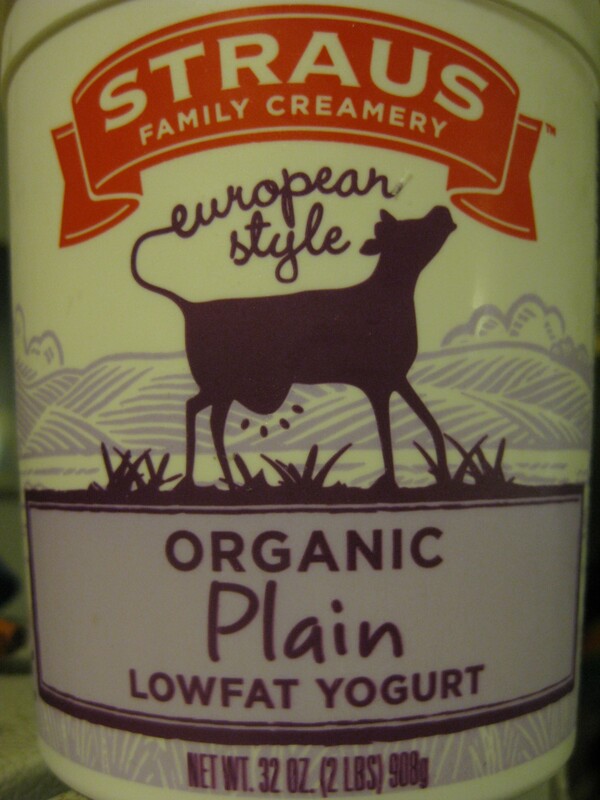 When she first opened her Straus Family Creamery European Style Organic Plain Lowfat Yogurt, she was shocked by how runny it was. She did not need a spoon. She just poured it into her reusable plastic Bircher Müsli container. Then she tasted it. It did not taste either European or European style. It tasted like sour mass market American yogurt. Smug Scout has eaten a lot of yogurt, if not yoghurt, in Europe, and she has never felt that “American Style” sour shock in her mouth. Last night, in an attempt to get closer to the bottom of this bottomless yogurt container, Smug Scout prepared an extremely spicy Indian dish (Tofu Vindaloo with local, seasonal, organic vegetables, if you must know) just so that she would need a large portion of raita. She even threw in multiple jalapeños with all of their seeds to make her mouth so inflamed that she would not care about sour, runny, or fraudulent “European Style” yogurt. But this morning Smug Scout became quite cross when she saw how much yogurt is still left. She supposes she will dump it in the blender with some local, organic fruit. She supposes that will make approximately ten smoothies. Next time she will get Fage again. She will gladly pay the extra three dollars. Anyway, she probably gets “billions of beneficial bacteria” in all the moldy cheese she eats. This entry was posted in Buying food, Product review by Smug Scout. Bookmark the permalink. Smug Scout is just delighted to hear that you eat Fage with fruit (hopefully local!). Smug Scout would prefer to buy yogurt made in California, but she becomes quite disgruntled when the local artisanal product does not taste nearly as good as its non-local, non-artisanal competition. The real surprise was that Fage cost more than Straus at Whole Foods, since the intensely Smug product usually costs more. And thank you for reading Smug Scout. She does not forget that you were her first subscriber. I believe this fraudulent yoghurt is multiplying every time you put the lid on it.